I made these and they were sensational. Even my husband loved them and he’s not plant based. Thanks for sharing this recipe! That’s great to hear, Annice! So happy you both loved them. Thank you! I cannot wait to try these! I’m just curious, which ingredient(s) give this a saturated fat %? The bread crumbs or the coconut milk? They both contain a small amount. Hope you enjoy! Coconut everything, There’s a ton of fat in it… I don’t do anything coconut , hope I can substitute something else . You can try using aquafaba…the liquid from a can of chickpeas. It has a thick consistency that would adhere well. These are the best. Incredible flavor combination. Thank you! So glad you loved them, Leslie! Thank you! So is there some sorta trick to make the batter stick? Because I’ve made tons and tons of cauliflower wings and I’ve never had a problem with the batter sticking, but I just flipped these in the oven and literally none of the batter stuck, it’s very disappointing because I was super excited about how crispy and fish tacoish this looked. I have yet to taste them so I hope they don’t just taste like cauliflower tacos. Hi, Melissa. Did you use canned coconut milk? The kind in a carton meant for drinking would likely be too thin to help the batter stick. Or did you make any other changes? Make sure to flip them gently with a spatula, not kitchen tongs which could definitely pull the batter off. I’m not sure what went wrong then. I’ve only had positive reviews on this recipe and everyone loves it. Sorry it didn’t work out for you. Did you pat your cauliflower dry before breading it? I’ve always found that if my item is not dry before dipping, the coating will slide right off. I’m excited to give these a try this weekend! Hi, Kristen. No, I didn’t pat my cauliflower dry. You’re going to be dipping into the coconut milk before the breading anyway. I think it’s different with “slimier” foods like chicken or tofu, but I’ve never had a problem with the coating sticking on the cauliflower. Let me know how they turn out! Enjoy! What can i use instead of coconut milk? I have everything except that. Will regular milk and or eggs work. I know that won’t make them vegan but we are vegetarian so we have milk and eggs. Yes, you could use eggs just like traditional breading. Regular milk would probably be too thin. Let me know how they turn out! These are AWESOME!!! How can something so healthy taste so amazing?? Thank you so so much! Yay! I’m so glad you love them! Thanks, Christine! Also I can’t seem to Print this. Nothing works when I click that button. Hopefully it is just me and I will try again later! 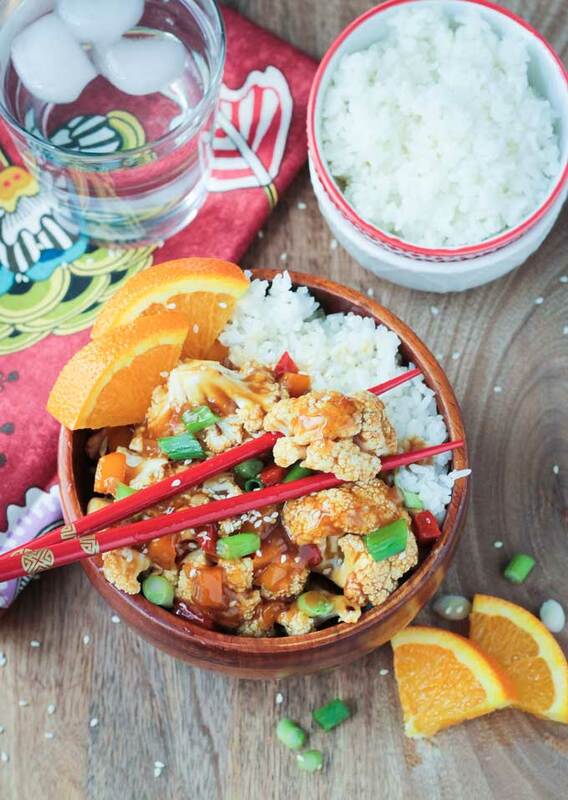 Thanks for sharing Plant based recipes with us! Hi, Jennifer. You can just use more breadcrumbs. What browser are you using? The print button is working fine for me, but I’ll have my tech guy look into it. In the meantime, there is a print button all the way at the top right under the recipe title as well – can you try that one and see if it works for you? Thanks! I made these last nite and had to call my mom (a fellow vegan)that these tacos blew my mind!!! I cant wait to make them for more people to try! Thank you so much, Chrissy! I’m so happy to hear you love them! WooHoo! So happy you loved them! All that searching for the coconut was worth it. 🙂 Thank you for your feedback!! Hi! Regular breadcrumbs would work…or even just more panko if that’s what you have. Hope you love them! These tacos are AMAZING. I wowed myself at my taco party. I even made my own tortilla shells from scratch. Even though the party was so much work, I can’t stop thinking about them so I’m making them again the next night. Yay! Thank you so much for the glowing review. I’m so glad to hear you loved them. And, wow, homemade tortillas?! That’s awesome! I bet that was one awesome dinner party!! Hi, Heather. The recipe serves about 4 with an average size cauliflower. That should give you a couple tacos each. I do usually serve it with a side. If you’re making several sides, this recipe would probably serve 6. I hope you all enjoy it. Please come back and let me know how they turn out! Loved , loved, loved these! Opened up a new way to enjoy cauliflower! Thank you!! They are a favorite around here too. So happy you loved them! Oh m gee…I made these tonight for the first time for my friends and their son who are not vegans. This was,another grand slam out of the park for them. They’ve said I could make this anytime I want for them. Thank you for sharing such a great recipe. That is so awesome! Thank you so much for sharing that with me, Stacey!! I made these for dinner tonight and they were SO good! My picky 8-year-old AND my picky 50-year-old both loved them. Thanks so much for sharing this recipe. Aw, thank you, Judy! Pleasing kids and adults alike – I love it! Thank you so much for taking the time to leave this nice comment. Enjoy the rest of your weekend! AH-MAZE-ING!!! These are so delicious, such a great combination of flavours and textures. We made these tonight for dinner and my meat loving husband and in-laws all loved them. My toddler even gobbled them down. Do yourself a favour and try this recipe out! Thank you so much, Marisa, for this awesome feedback. I’m so happy to hear everyone loved them. Even your toddler – that is a huge win! I’m starting my Saturday on a high note now – thanks!! Have a great weekend! I’ve never cooked with coconut milk before. Should I only be using the top cream part or the liquid as well? Thanks! Not this time. Shake up the can really well so it all mixes together. If you’ve already opened the can, use a whisk to incorporate all of it together. Enjoy! i just made this, love the favor and color. Thanks so much for this recipe. i have one question though: the cauliflower is soft instead of crunchy. I am wondering what I did wrong? I bake under 420F for 25 minutes. Hi, Nina! 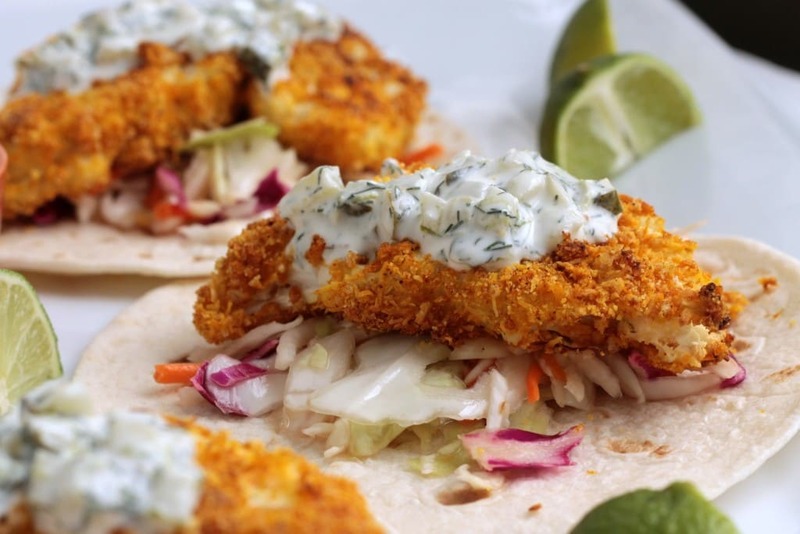 The cauliflower itself should be tender, but the outside breading should be crunchy…basically like a fried fish taco would be. If your breading wasn’t crunchy, then maybe it just needs to be baked a little longer. Every oven is different and holds temperature differently. Glad you liked the taste! The photos looked so amazing, and the finished dish did not disappoint! The flavor combination was fantastic. My husband loved them too! 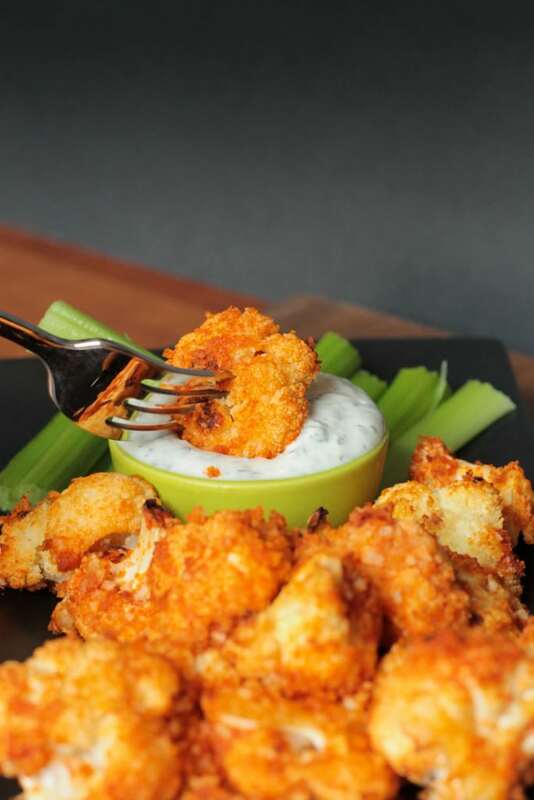 We are big fans of roasted cauliflower. Next time I might try these with the packaged unsweetened coconut milk, rather than full fat canned coconut milk, to cut the fat and calories. I’m so glad you loved them, Cheryl! I’m sure light coconut milk would work too. Thanks for your feedback! Just made these tonight – omg they are so delicious! Thank you so much for bringing this dish into my life! Oh, that’s so great, Danielle! Thank you for making them and stopping by to let me know the results. I’m thrilled that you loved them! Happy New Year! Hi, Jess. I have never tried freezing it. It might work though. I would spread them out on a cookie sheet and set in the freezer until frozen. And then you can transfer them to a freezer bag or container. Let me know if it works! Happy Holidays! AMAZING. Made these tonight just as the recipe suggests with the exception of the panko- thought I had some and I did not, so I used regular bread crumbs and I did cheat and use regular mayo- Other than that followed the recipe just as is with all the spices exact. So so so so good. I used to cook a lot when I was married and for the past year since I have been separated, I have not. I figured it was time to get back to something I love. These fit the bill just perfectly. Yes, it is a bit of prep but it could not be more simple and its worth if! Thank you for sharing. I will most certainly be making these again and having leftovers for a few days. Sarah, that makes me so happy! Nothing better than enjoying your time making and eating a home cooked meal! Thank you so much for making them and for stopping by to leave me a comment. So happy to hear from you. Enjoy your weekend! Yum, these look amazing! I’m definitely going to give them a try, as I love cauliflower. Love that you baked them, I always choose baking instead of frying. Very creative, thanks for sharing the recipe! Thank you, Abby! This is the MOST popular recipe on my blog, so I don’t think you will be disappointed. Enjoy!! Wow! These were so tasty! We used corn tortillas toasted on the gas stove top. So good! That is so awesome to hear, Barbara! Toasted corn tortillas sound awesome! Thank you for stopping by and letting me know! Have a great weekend! Hi, Jeanette. You can just use more breadcrumbs. 🙂 I hope you love it. Let me know how it turns out! Just made these for lunch. Quick and easy and DELICIOUS! I can’t wait to try your other recipes! Thank you so much, Jaime! 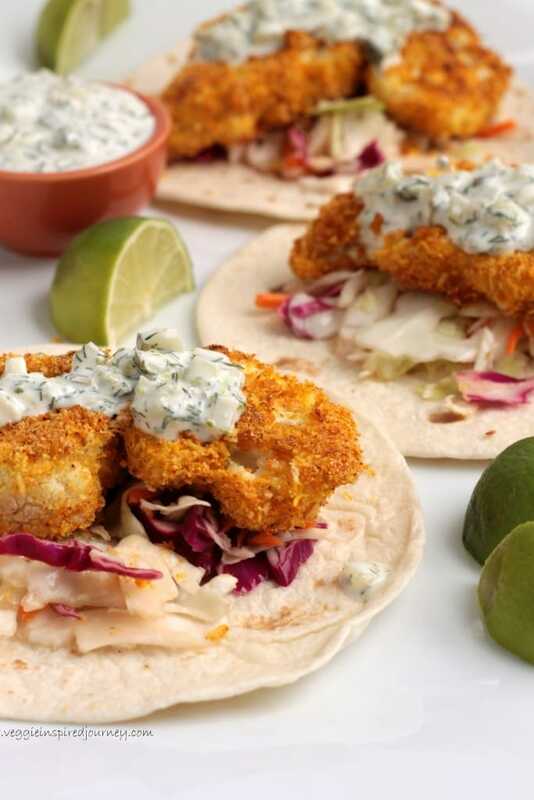 I get cravings for these crispy cauliflower tacos at least once a month. I’m so happy to hear you loved them. Please let me know if you try anything else! Enjoy! Thanks again for stopping by! I can’t wait to make this tonight! Do you think regular flour or even chickpea flour would work the same as the cornmeal? Hi, Cinthya. I haven’t tried it with flour. Cornmeal has a nice crunch, which contributes to the crispiness of the dish. Flour might work, but might not be quite as crunchy. Let me know how it turns out and what you decide to try. Thanks! Thank you, Donna! So glad you love them! OMG! 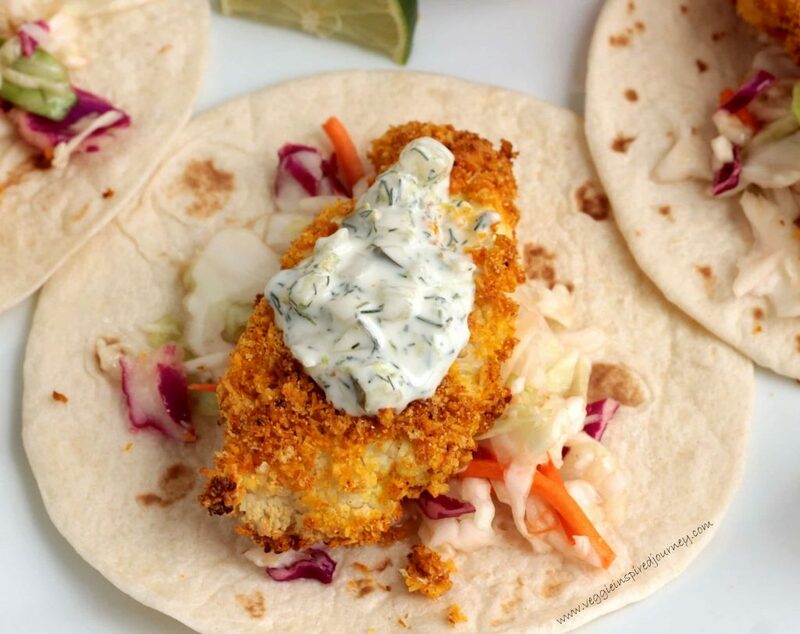 My favorite food use to be fish tacos and I’ve been searching for a veggie substitute…and you nailed it! This is definately being made again. I don’t do vegan mayo, so i blended a 1/4 cup of the remaining coconut milk with a large avacado…so yummy! Thank you so much for this recipe! Thank you, Tara!! 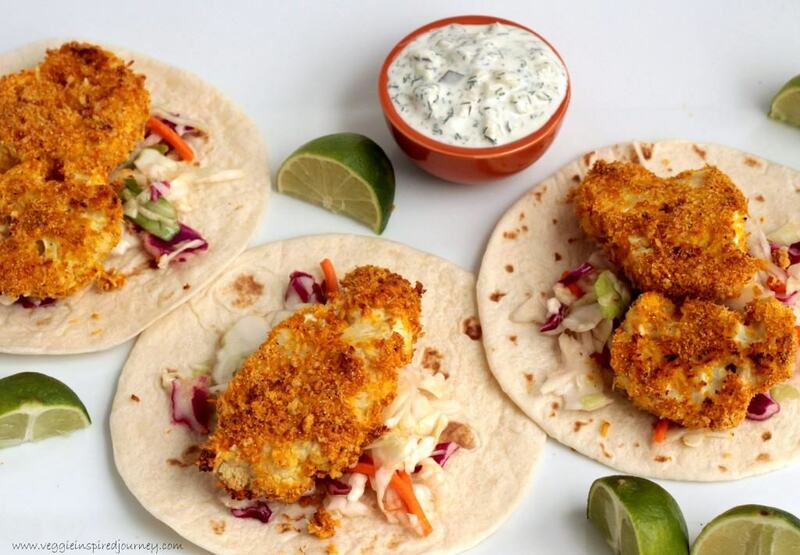 I was always a huge fan of crispy fish tacos too…exactly why I had to create this recipe. I LOVE LOVE LOVE your idea of blending coconut milk with avocado and will definitely be trying that next time! I’m so happy to hear you loved it! Enjoy your weekend! I’ve had this recipe pinned for a while now and I’ve been drooling over it. I finally made and I was not disappointed! Everything about this recipe is delish! I will be making it again because the whole family loved it. Thanks!! That’s so great to hear, Chelsey! I’m so glad to hear everyone loved it. Thank you so much for coming by to leave your feedback. Have a great week! These are amazing! You don’t even realize you’re eating cauliflower! I am a huge coconut lover, and this recipe had just enough of that woonderful coconut flavor. My sons don’t like tumeric so I left it out, but it still was plenty flavorful! Thanks so much for a GOOD veggie taco! Oh, I’m so happy to hear that Emma!! 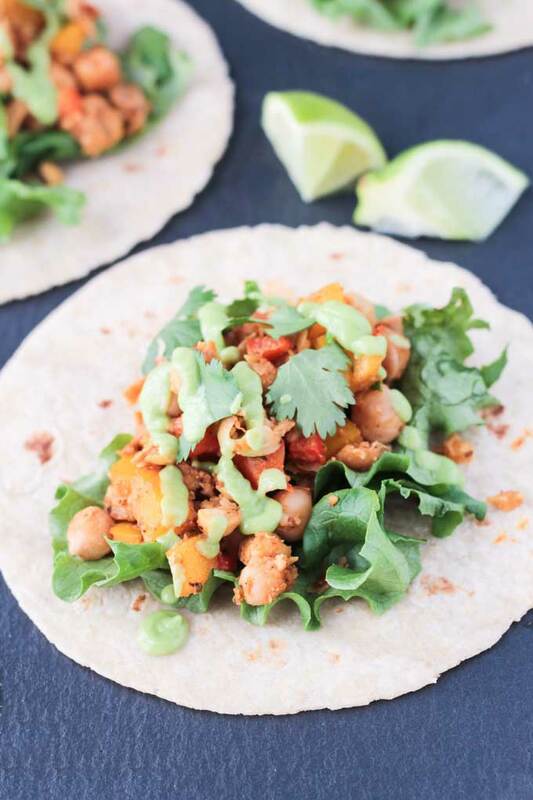 Cauliflower tacos will soon take over the world! 🙂 The turmeric is really just for color and because it’s so super healthy, but doesn’t lend much flavor here, so leaving it out wouldn’t change the results. Thank you so much for stopping by and leaving your glowing review. Have a great rest of your weekend! Mary, that makes me so happy! Definitely no lack of flavor in this dish! And great that your company loved it too! I know what you mean about some of the food tasting the same…I fall into that too sometimes…but there really are so many flavors and textures available on a plant based diet. I hope you try some more recipes from my blog and find some more to love. Let me know if you do! Have a great weekend! OH MY GOSH! Just had these tonight. Sooooo delish! 15 yr old daughter recently went vegan. I found the recipe she made dinner ,I would go vegan if it all was this delish. Subbed cilantro for dill. Won’t let me do 5 stars. Thank you, Didi! I’m so happy you loved them! Good luck to your daughter on her vegan journey. I hope you find many more recipes to love here. I would suggest my Butternut Mac next – that one is beloved by everyone as well!! Thank you for stopping by to let me know (and thanks for the heads up on the rating – I’ve been having problems with it for some reason – need to look into that some more). Have a great week! Jenn, these cauliflower tacos are simply AMAZING! My fiance and I both loved them and can’t wait to make them again! The coconut crust was fabulous, the sauce was super flavorful and neither of us could believe we were eating cauliflower! It was so flavor-packed and just all around delicious, I can’t say enough good things about them! Thank you so much for sharing this 5-star recipe! Aaaaah, thank you, Stacey for your awesome feedback! That totally makes my day! This was a wonderful dinner. Thank you. However ’20 minute prep time’ is a joke. I’m no kitchen ninja, I admit, but prep time was closer to an hour. It was worth it for sure but I’m glad got off to an early start. HaHa, well I am part ninja! Just kidding. Thanks for the feedback, Charles. I’ll time it again next time and adjust as necessary. I’m so glad to hear you liked them!